An article in The Atlantic called “How To Stop Bullies” caught my attention this week with a MIT professor’s insight on cyber-bullying. 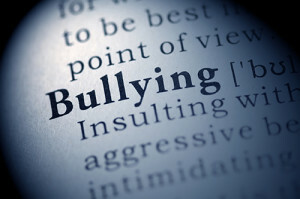 Cyber-bullying, has been described as a “new” kind of bullying using technology and including things like hurtful emails, texts, and embarrassing pictures or fake profiles. While the medium that bullies are using to spread messages of hurt and hate may be new, the messages are not, explains Henry Liberman. Using software designed to filter negative and offensive content by looking for key words in postings, he and his team discovered that 95% of bullying comments fall into 6 categories, post after post. Ready for them? Humans have essentially been using the same kinds of insults since we came up with cave paintings. In fact, in the past few years archaeologists have discovered that the ancient city of Pompeii is covered in graffiti. Call it the Twitter of antiquity. And our austere Roman forbearers weren’t all debating the merits of democracy and coming up with epigraphs. Here’s a few of my favorite messages (and their English translations). Look around the web and you’ll find even more examples that would put a modern-day truck stop bathroom to shame. Amazingly, long after Pompeii was buried beneath lava, the Roman Empire was decimated by Huns and the original Latin ceased to be used, these words have been discovered, translated and analyzed. I wonder—if your tweets, posts and blogs were discovered 500 or even 50 years from now–what future researchers would say about you. Would your online persona reflect a more modern, enlightened being or a tech-savvy caveman, trading in his chisel for a keyboard? Looking at the lasting effect of words, whether they are carved into a wall or posted in a digital space, I hope we can join together in a conscious evolutionary leap forward. Can we begin to litter social media with positivity, encouragement and kindness? Imagine what would happen if we did. This entry was posted in relationships, sticks and stones and tagged attitude, Bullying, feelings, Integrity, Love, perspective, Positive, relationships, Sticks & Stones, Tweets, Words on March 10, 2014 by Dave Weber. Dave Weber challenges your communication style. To bring Dave Weber to your organization or for more information on “Leadership Redefined” or “Sticks and Stones Exposed: The Power of Our Words,” go to daveweber.com. If you have trouble viewing YouTube videos, click here to watch this presentation on WeberTV. This entry was posted in Leadership Redefined, relationships, Success and tagged attitude, Body Language, challenges, change, Communication, Experience, Learning, Listening, perspective, relationships, Success, Team on January 28, 2014 by Dave Weber. The older I get (the half century mark is approaching very fast and that older looking man in the mirror won’t leave me alone), the more I realize just how much “stuff” I tend to hold on to that really negatively impacts my quality of life. In fact, I am starting to feel more and more like Rocky in his last movie. Did you see it? I think it was called “Rocky 18”. Not really. It was “Rocky Balboa”. In it, an aging Balboa is drawn back into the ring, as he puts it, “To get the ‘junk’ out of his gut.” You see Rocky had been holding on to some stuff in his life– cares and concerns that were dragging him down. And these cares were preventing him from moving forward and truly enjoying life. Free your mind from worry. When we worry, we borrow cares and concerns from tomorrow and we drag them into today. Once we get them here, they just ruin our present. Free your heart from hatred. This one is very similar to the first strategy only in the opposite direction. When we harbor anger, resentment, and bitterness toward someone for something that happened in our past, it is like handcuffing ourselves to them and pulling them around with us all the time so they can continue to ruin our present. Free you life from complexity. Simplify. Look for things that can be pruned out of your life. Are you so busy doing all those “good things” that you are killing yourself? Cut some out. Free yourself from greed. Many people tend to get caught up in two twin syndromes: the “get as much as I can” syndrome and the “hold on to it as long as I can” syndrome. When I fall prey to these two, I find myself going through life clutching tightly to all “my stuff “and worrying about it. Giving is a wonderful antidote to battle greed. It helps us take our eyes off ourselves and focus on helping others. Free yourself from expecting perfection. To put it more simply, expect less. No one is perfect. People are going to mess up—including you. My bride is going to disappoint me…so are my kids…so are my colleagues at work…so is the gate agent at the airport and the kid washing my car. When we expect perfection, we can only be disappointed (or neutral at best). But when we don’t expect it and we get it…it’s GREAT! Implement these strategies and set yourself up to live a life full of pleasant surprises…it is way more fun. This entry was posted in change, feelings, perspective, relationships, sticks and stones, worry and tagged attitude, challenges, change, Fear, feelings, perspective, relationships, Sticks & Stones, worry on March 11, 2010 by Dave Weber. This has been a very different winter in Georgia. We have had more instances of snow than I can ever remember (and I have spent 40 winters here). It’s been very fun! As a result, I have paid more attention to two very different tools than ever before: the thermostat and the thermometer. Honestly, I haven’t given these two tools much thought in my life. I always kind of put them in the same camp…you know, they have something to do with temperature. But in actuality they are quite different…almost opposites. A thermometer is used to measure the temperature. To passively “observe and report”. To not interfere or influence. But a thermostat is just the opposite. Rather than measure the temperature, a thermostat determines what it is going to be. Rather than passively “observe and report”, a thermostat actively engages and creates. Rather than stay in the background and not interfere or influence, a thermostat fully engages and influences. Do you realize people have the same abilities as these two tools? We can sit back and measure everything that is going on around us and have no influence on the situation or we can get in there and make the changes that we want to see. Reality Check: it is easier to be the thermometer, but much more rewarding to be the thermostat. What is cool, though, is that we can be both! Learn to “see” what is going on around you: the atmosphere at the kitchen table, the environment of the office, the climate of your relationships—this is being the thermometer. Then, if you don’t like what you measure, change it—this is being the thermostat. What kind of an environment would I like (in the office, home, relationship, etc.)? What do I have to do or be to help move things in that direction? This entry was posted in relationships, sticks and stones and tagged attitude, change, Culture & Climate, feelings, Listening, perspective, Positive, relationships, Sticks & Stones, Team on March 4, 2010 by Dave Weber. You can find great truth in the old saying, “There are two things that can never be taken back, the sped arrow and the spoken word.” Boy, is that true. Have you ever found yourself trying to get those “just spoken” words back into your mouth? I know I have. It is as futile as trying to get the toothpaste back in the tube…once it’s out, it’s out. I don’t know why we have a propensity to do this—maybe in the fast pace of this world in which we live, we find our words flying out of our mouths before being deflected by thought. Did you hear it first hand or did your colleague say she heard it from this guy in the North Region who overheard his boss on the phone…you get the picture. If you can’t verify it, don’t repeat it. And another thing, just because it is the truth does not mean it needs to be repeated. People don’t have a right to know everything (more on this later). This one is so simple. Is what you’re about to say going to build up or affirm someone or is it going to tear them down or embarrass them? If it is not kind, zip it…even if it’s true. Is what you are about to say really necessary to the conversation or do we just want to use some words? Be honest aren’t there times we want to be perceived as the person with some insider information? There are also times when we just want to hear ourselves talk. Fight the urge. Let the moment pass. I have found that allowing my words to pass through these four filters causes me to say a whole lot less that I want to take back. This entry was posted in attitude, feelings, perspective, relationships, sticks and stones and tagged feelings, Filters, Positive, relationships, Sticks & Stones, Truth, Words on February 16, 2010 by Dave Weber.